The route from A Coruña, also known by Camiño do Faro begins at the foot of the illuminated lighthouse of Tower of Hércules. 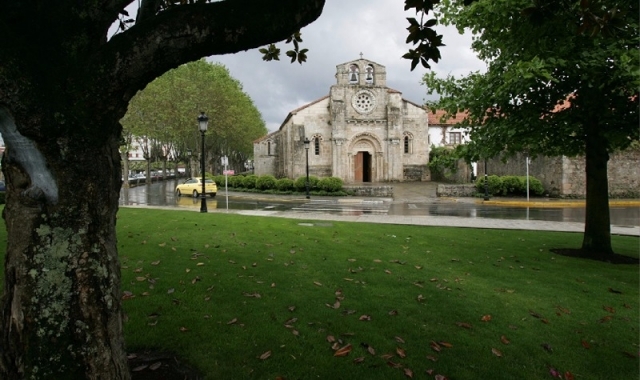 Its passes through the town of Bruma where it coincides with the route from Ferrol. Bruma is the milestone where the two routes of the English Way meet. The first stage from A Coruña goes through the municipalities of Culleredo, Cambre, Carral, Abegondo and Mesía, on a path of moderate difficulty until it reaches the end of the step and encounters steep slopes. 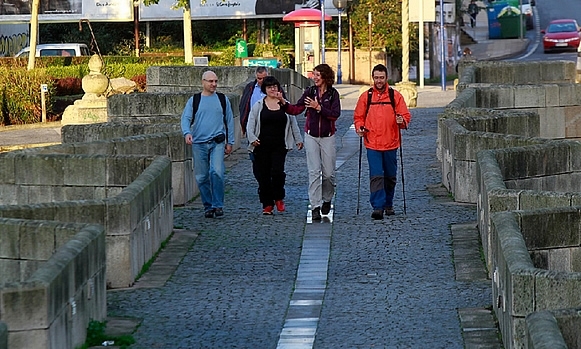 On the opening day, the pilgrim walks a distance of 32 kilometres; a considerable but achievable walk at an even pace and bearing in mind that the route of A Coruña is reduced to just three stages until reaching Santiago, 74 kilometers in total. From a purely urban environment on the first third of theirs journey, the Camino leaves behind the Atlantic facade and enters in chestnut tree forests, and woodland trails, a pleasant walk. The downfall of this stage is the port directions you encounter in the centre of A Coruña and the ease at which you can get lost in Cambre, where you have to take special care not to deviate from the path. Surrounded by services, the route does not present a problem for refueling, although the final kilometers of the trail meander away from populated centers. The port of O Parrote is the historical reference place for pilgrims arriving in A Coruña. In the same way, as the port of Ferrol, A Coruña is noted for its strategic location as a point of arrival between the towns of Ártabro Gulf since the invention of the Camino in the Middle Ages and the first pilgrimages from northern and western Europe to visit the tomb of Apostle Santiago. The first reference to the pilgrims, and current starting point from A Coruña, is the church of Santiago, the oldest temple in the city, built in the twelfth century and located in the old town, at number 1 on Calle Parrote. Of Romanesque origen and built on an earlier chapel, it retains three apses from the original building and its facade is an image of Santiago on horseback, and numerous other Jacobean motifs. A short distance away, at number 12 on the same street, you can collect the credentials for Compostela, although only on Thursdays from 17:00 to 19:00 hours. The area retains vestiges of military architecture and remains of the protective walls of the original settlement of the city, flanked by the Castle of San Antón, Home to the Archaeological Historical Museum, and the stronghold known as Fortaleza vieja (Old fort) currently the Garden of San Carlos. Beginning the step from the church of Santiago, just over a hundred meters away you will find Maria Pita Square and the Town Hall. Due to poor signage of the Jacobean route in the city center it is advisable to follow the street signs. From the square of Maria Pita the route continues along the Avenida de la Marina, under the famous buildings of shining galleries and arcades, from which the city earned the nickname of the City of Glass. Following in a straight line, the route runs parallel to Los cantones and passes through the emblematic Obelisco (the city’s clock), built in 1895 in memory of Mayor Aureliano Linares Rivas. Without deviating from the straight line, continue along Sanchez Bregua Street, leaving on the right Ourense Square and the Government Delegation building to the left. Continue straight down the avenue Linares Rivas and you will reach the fountain of Cuatro Caminos via Fernández Latorre street. The Camino crosses the square leaving the fountain to the left and continues straight along Marqués de Amboage, until a slight uphill curve, next to the bus station, continue to Avenida Alfonso Molina and a pedestrian bridge that crosses the four lanes of the main road. You leave this behind and continue straight on smooth downhill walk until you reach the roundabout that connects with avenida de Monelos, next to the multipurpose administrative building. From there, you begin to see signs and should have no difficulty in orientating the kilometers ahead. Cross the roundabout (second exit), and begin an ascent towards the neighborhood of Eirís, exit from the city. Almost at the top, the road runs into a roundabout in an area of building work. Here you turn left onto a cement path to join again avenida de Monelos. The gentle climb leads down to the avenue of Montserrat, the hiker is accompanied by beautiful views of Santa Cristina (left). At the end of the descent you reach the Arms Factory, just before a short stretch on the N-550. This brief encounter with the main road requires extreme caution, because it is a very busy road. On the right there is a supermarket Alcampo and a petrol station. Staying on the road, the pilgrim reaches Culleredo via Avenida Miguel González Garcés (Portazgo) and turns left onto a narrow street (Rio de Quintas). It is a small section next to an old stone wall but a lack of signs can lead to confusion: take the second turning on the right, Eduardo Blanco Amor-street, downhill and then take the next left onto Jorge Guillen Street until reaching a pedestrian crossing in avenida Fonteculler. You cross towards urbanization A Ría, from where you can access to the river promenade of O Burgo. Large green areas and a bycicle lane dominate the area, again lacking in signposts. Do not despair, the hiker has to complete the Riverwalk until the bridge of O Burgo, a construction dating back to the XIV century built on the remains of a Roman bridge. Bombed by the British in the Napoleonic wars, the infrastructure is a symbol and reference point to communicate the towns of Culleredo and Cambre. On the other side, there is a shining monument to the pilgrims and a stone cross (22kilometers to Bruma / 64 to Santiago). From here the march goes up on the right, to the church of Santiago do Burgo, an obligatory stop for pilgrims. Erected in the mid XII century under the order of the Knights Templar, the chapel retains traces of Romanesque style despite reforms in the late eighteenth century. It houses the images of Santiago Peregrino, Santiago Matamoros and the virgin Pilgrim. Continue the path to Rua Colina (left) and Rua Picasso to join the avenida de Galicia (left). Follow along Fonte dos Pelamios and the street from which it takes its name to San Xiao cavalcade, in the parish of Almeiras, and near to the airport Alvedro. Pass the road in front of Almeiras a neoclassical church, Rúa Choeira and Rúa das Catas. Turn immediately left on to rúa Arcebispo Xelmírez, bordering Castro de Alvedro until you get back to the N-550 and the entrance to a business park. Parallel to the industrial area, the route continues left and crosses the river Valiñas by the medieval bridge of A Xira. It is the entrance to the council of Cambre, in the parish of Sigrás. passing Souto and Sobrecarreira to connect with the Cabana-Anceis road, until A Rocha, the roundabout of the N-550 and access to the A-6 motorway. This stretch from Almeiras occasionally leads the walker to rural areas, leaving behind the busy road and the annoying traffic noise, not to mention the threat posed to the passers by. There remains a second half of the stage, well signposted with milestones and yellow arrows pointing to Compostela. The camino leads to the chapel of Anceis (Cambre), and its collection of historic and artistic artifacts of great value. The first thing the pilgrim encounters is the pazo (manor house) of Drozo (left) and in front of the fountain of San Antón, a beautiful statute. The pazo dates back to the late XVI century and is one of the most antique buildings in the area. A few strides further ahead you arrives another manor house next to the Camino, the walled manor of Anceis, also known as Pazo do Conde. An impressive coat of arms crowns the facade of the building, constructed in the XVII century and recently restored. In front of its entrance there is a cross in the small square of San Marcos, where the pilgrim will also find a drinking tap. You leave the asphalt path five hundred meters ahead to take a dirt track that leads to the town of Carral (11 kilometres to Bruma / 53 to Santiago). The path ends in Lameira, next to the building of a popular bakery Panadería da Cunha, with has an office and a cafe. Once again on cement, you pass through Corpo Santo, Segurde and Cañás, all well signposted. After a downhill stretch, the route deviates to the right onto a earthy path –some what muddy with rain- that leads to the border between Carral and Abegondo. The pilgrim reaches Aquelabanda (CP-0103 Montouto-Carral road), a picturesque place for its pretty chapel in honour of San Juan (1697) and that belongs to the parish of Santa María de Sarandóns. There you will also find the well known house of Felipe II, named so as on an inscription on the building’s facade that remembers his stay in 1554. Prince Felipe, son of King Carlos V, travelling to A Coruña to embark on a journey to England to ask for Mary the Tudor’s hand in marriage. Aquelabanda is a good area for a stop, as it has a bar (Café Bar Centro) and a shop (Ultramarinos Quintas), facilities separated by the bridge over the river Barcés. This is also the beginning of a hard climb until the end of the final stage, so it is better to approach it with renewed vigor. Bit by bit, the path becomes steeper along the asphalt road that connects with the AC-222. On crossing, the pilgrim enters Carral, via the parish of Santa Mariña of Beira. Before the long climb to the top of Peito. It seems to never end, and after each bend, you hope for flat land, and all that comes is another slope to challenges the pilgrim’s legs, until reaching the first farm (on the right). The effort required for this climb is compensated by the panoramic views over the estuaries of A Coruña and Ferrol Ares. Reaching the top, at the crossroads with the AC-522 road, the itinerary nears the end on an earthy path, which further along disappears among meadows. By contradiction you have to look out for milestones indicating the route which direct you to paths that have almost disappeared. Enter a covered and shaded path in Loureiros, until joining again the road in Travesas. Continuing along the pavement, you arrive at the bar and tobacco shop Casa Avelina, the last establishment until Meson do Vento. The next reference is an electric plant, the point at which you completely abandoned the AC-522. Crossing to join the dirt tracks that give access to the pig and mink farms of the area. It is here that the two English Caminos, the one from Ferrol and that from A Coruña meet to share the last meters until the hostel of Bruma in the council of Mesía, the end of the stage. 1 reviews Distance to Santiago: 41 km. 2 reviews Distance to Santiago: 72 km. 1 reviews Distance to Santiago: 62 km.